The Economic and Social Council (ECOSOC) is one of the United Nations’ six main bodies established by the UN Charter in 1946. It has 54 Members, elected by the General Assembly for overlapping three-year terms. ECOSOC serves as the central forum for discussing international economic and social issues, and for formulating policy recommendations addressed to the Member States and the United Nations system. ECOSOC coordinates the work of the 14 UN specialized agencies, nine functional commissions, and five regional commissions. 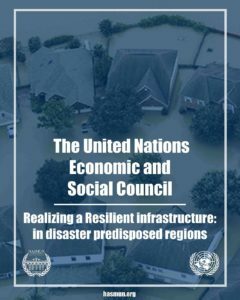 In the ECOSOC Committee, we will be discussing Realizing a resilient infrastructure in disaster predisposed regions.